This year we decided that we wouldn’t have a party for Archie’s third birthday. With his Autism, he doesn’t cope very well in group situations, nor does he manage well socially. It’s all too much for him, he gets so overwhelmed and distressed which just results in a meltdown. This is not how a child should spend their birthday but just because he isn’t having a party doesn’t mean he can’t have cake! I didn’t want to create a big cake like I have done his previous birthdays, I just wanted something small & simple as it would only be us four spending his birthday with him. 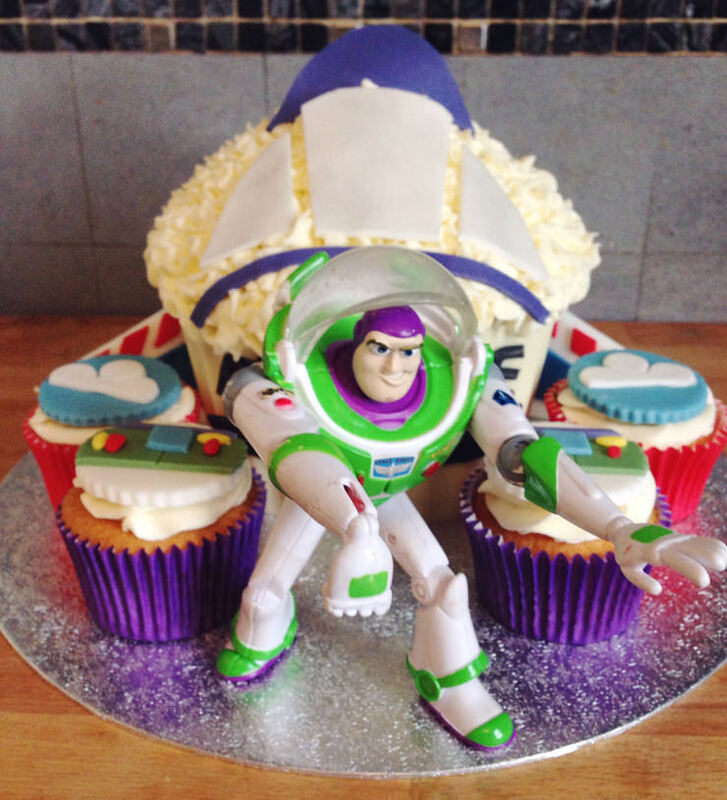 He loves Toy Story & his Buzz Lightyear toys so much so I came up with the idea for how to make a Buzz Lightyear Rocket Cake. 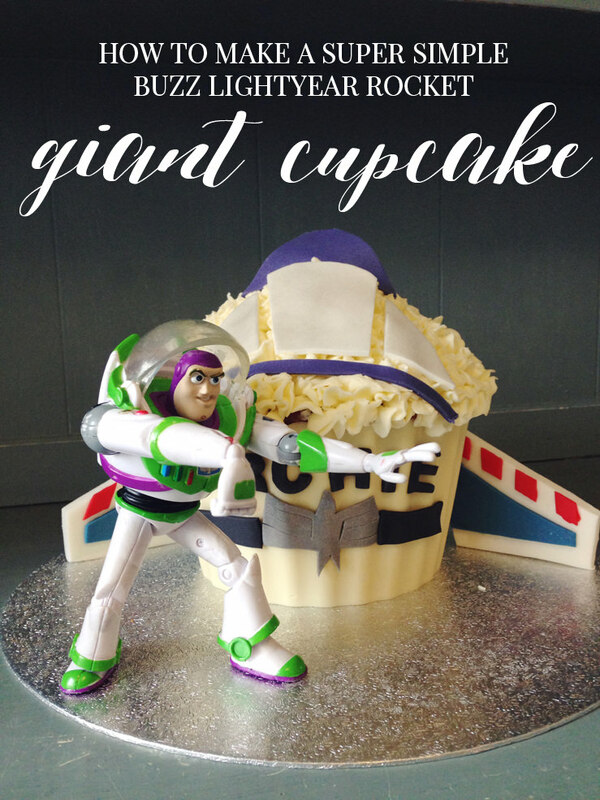 Instead of going down the complicated route of carving a cake into the shape of a rocket I made a giant cupcake. You can buy the cake pans from most shops now costing only about £5. I’d recommend buying a silicone one as this works as a great mould to create the bottom ‘chocolate case’ for the cake. After baking the cake and allowing it to cool, I then washed & reused the bottom part of the silicone mould to create the chocolate case. It’s much easier to do this in layers, using a spatula or pastry brush to coat the mould in melted white chocolate, allow to set in the fridge & repeat. Once the chocolate has fully set insert the bottom part of the cake into the case then use whatever filling you prefer, we used jam & buttercream, then add the top. Simply pipe the top of the giant cupcake then set aside and allow the icing to set whilst you move onto the second part of the cake. To create the simple detailing I used fondant which I coloured with gel colours, not liquid colours. The fondant icing alone will be too soft to create the details so I needed to add a little Tylo powder which turns the fondant into a modelling paste which is much easier to work with and will hold its shape & harden. 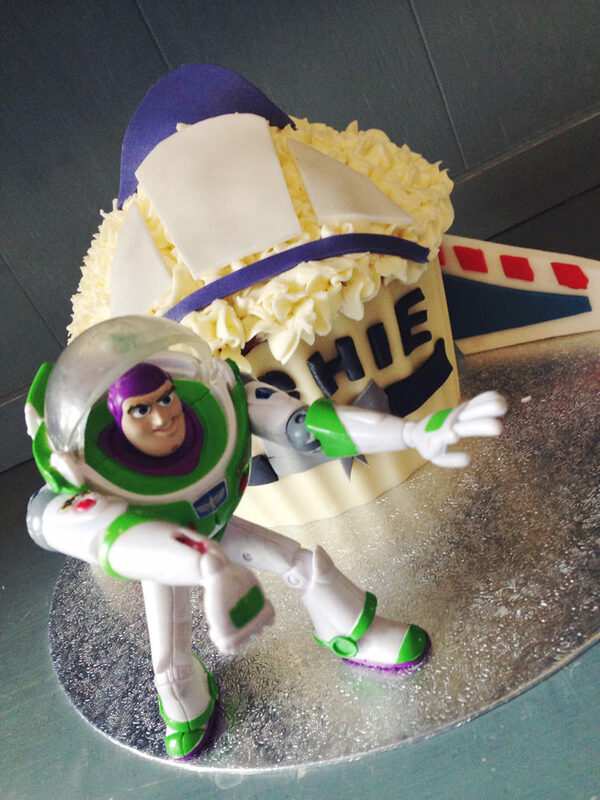 Once the fondant parts has set & hardened I then started to put it all together, I then realised I’d forgotten about the ‘Buzz Lightyear’ that goes across the front of the rocket so swapped this for Archie’s name, perfect! As he was going into nursery the day before his birthday I decided to make some matching cupcakes too for him to take in for all the other children. Again I just made some simple designs as I had such a busy week with clients cakes that I didn’t have time for anything too extravagant but I think they looked fab. 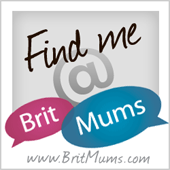 What do you think to this simple version? Do you make your own cakes or leave that to the professionals? now this is a very cool cake! I bet your son loved it!